Preheat the oven to 275°. Line a rimmed baking sheet with parchment paper. 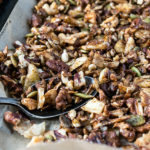 Mix pumpkin seeds, walnuts, pecans, sunflower seeds, cashews, banana chips, and coconut flakes on the baking sheet. Drizzle on coconut oil and maple syrup, stirring with a spoon to cover the nut and seed mixture in oil. Bake for 30 minutes, stirring halfway through. Remove from oven and add molasses, cinnamon, ginger, allspice, nutmeg, and ground cloves, again stirring with a spoon to cover the entire mixture. Bake for another 10 minutes. Let cool, then crumble and store in an airtight container for up to 2 weeks.